Season salmon with salt and pepper. Heat a heavy sauté pan over high heat, and then add olive oil. Place the salmon in pan; sear each side until well browned. 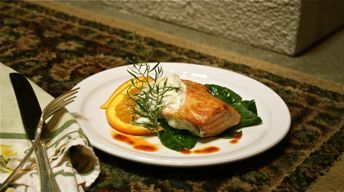 Transfer salmon to a baking sheet; place in oven for 6-10 minutes depending on thickness of the fish. Remove from oven and squeeze the lemon over fish. Top each with orange-herb aioli and serve. Place 2 egg yolks, vinegar, dry mustard and cayenne pepper in work bowl of a food processor and pulse to combine. While machine is running, slowly drizzle 2 cups of the olive oil into the egg mixture through the top -- this will thicken to form a mayonnaise. More oil may be needed if aioli isn’t thick enough as the orange juice will thin it out some. Add orange juice and mix well. Transfer aioli to a mixing bowl; stir in orange juice and chopped herbs. Season to taste with salt & pepper.